Created along with it's counterpart Hyalo 2 (Rose) and Luma for Fuse Art Infrastructure's "NOW" series of exhibitions, it builds off of techniques developed in its predecessor, Hyalo, of combining projected light and painted color to optically blend to an irridescent, stained-glass like third color that shifts and changes as the viewer moves around it. Positioned in the corner of the room, the perspective also shifts as the viewer moves through the space. 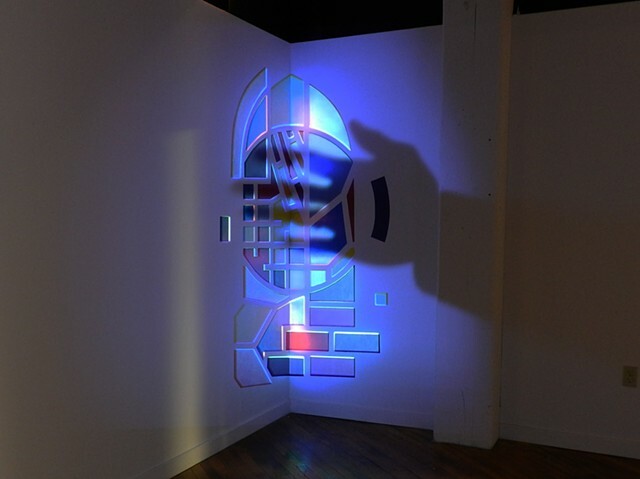 The reflected light bouncing into the corner causes a further dynamic distortion of color as the viewer moves in front of the projector, blocking it (and revealing the painting underneath). The point in the room at which the image coheres perspectivally positions the viewer directly in the path Hyalo 2 (Rose), blocking that image's projection and revealing the painting beneath. The three projection pieces in the room constantly work to reveal and confound each other and bring a new awareness to the viewer of the space and his presence in it.